It’s funny to think that I worked at MUTV for 6 years, but today was the first time I’ve actually seen a Premiership match for real! I’d been at Old Trafford loads of times during games, but always in the depths of the stadium, with thousands of fans above me! The reason I got to see a match is that I’ve recently been doing some camera work for Channel M, and I was down at the City Of Manchester stadium for the City v Wigan game, getting some vox pops with fans before the game, and after the game, to film interviews with City’s manager Stuart Pearce and one of the players in the tunnel. 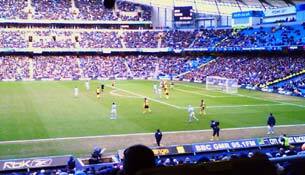 City actually lost one nil, which wasn’t ideal really! And it wasn’t a particularly exciting game in general – so my first proper taste of seeing a football match wasn’t the greatest! Well after nearly seven years, I will be saying goodbye to my little red Fiesta this week. 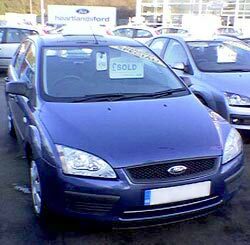 I was down in Tamworth today, and I went to have a look at some Ford Focuses and ended up buying one!! Basically my current car’s MOT is due at the end of the month, and I’m pretty sure it won’t pass (I only just managed to get it through last year) so I thought it would be best to look at getting another car before spending any more money on it. The one I’ve bought is 9 months old, with just 12,000 miles on the clock, and I’m going back down at the end of the week to pick it up. I think it will be quite weird because I’m so used to my Fiesta, but I’m really looking forward to getting it! It’s been a pretty busy week – I’ve been doing a few different jobs, and yesterday I was down in London with James with the rest of the Preview team about the DVDs we’ll be producing every 4 months. It’s going to be quite intense at first I think as we sort out exactly how it’s going to work, but after we’d had the meeting, I felt a lot more confident about it – which is a good thing! Also, I’ve got someone who’s going to do me some plans for an extension to the kitchen, and I’ve got to sketch out all the dimensions and take a load of photos for them to do it. It’s being done as a bit of a favour, so it’ll take a while, but it should hopefully mean I can get all the work done by the summer!